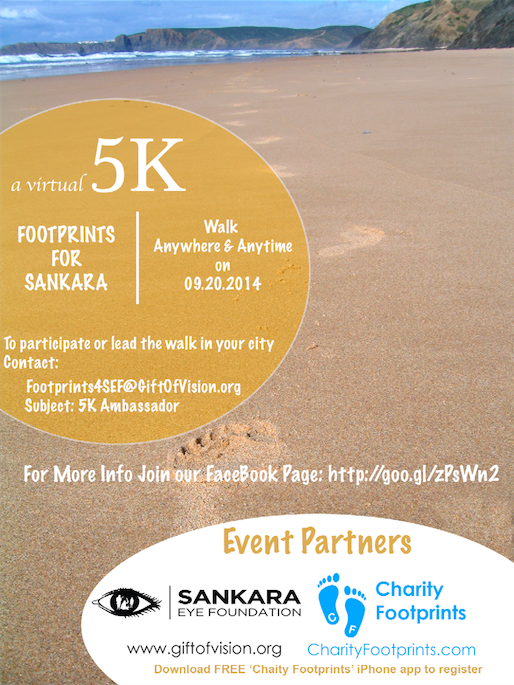 Jersey City, NJ, August 21, 2014 – Charity Footprints has teamed up with Sankara Eye Foundation (SEF) to run a first of its kind Global Virtual 5K Walkathon. This virtual walkathon will give the volunteers and supporters of SEF worldwide, an opportunity to walk anywhere in the world and at anytime on Sept 20th 2014 to show their support for SEF. There is a $30 per person (cost of 1 eye operation) fee to register for this walk, and a suggested fundraising target of $150 per person (open 1 eye for every kilometer you walk). This event would not just raise much needed funds to facilitate more free surgeries that Sankara Eye Foundation could conduct, but also allow the participants to raise awareness for an organization which is so close to their heart. For more information or to join over 200 people walking across 4 continents and 35 cities, please email: Footprints4SEF@GiftOfVision.org. For sponsoring the walkers/runners and media relation queries, please email: support@charityfootprints.com.